Homer sends the hero of THE ODYSSEY to interview the dead in order to discover his destiny. 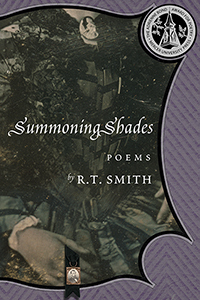 The poems of R. T. Smith’s SUMMONING SHADES pursue a similar mission, bringing to life in monologues and narratives figures from history and recollection, all rendered with careful attention to the idiom, customs, emotions, and ironies of their time and region. The earlier, nineteenth century figures include Mary Lincoln, Ambrose Bierce, Meriwether Lewis, Federal veterans posing as casualties for photographers, women in a Winslow Homer painting, and Audubon’s assistant Joseph Mason. All are rescued from the shadows long enough to reveal their natures and often-gothic moments of crisis. The more modern figures include Lizzie Borden, Patsy Cline, and a gallery of characters summoned from small-town Southern sources--a roguish uncle, a dishonest investigator, a furious neighbor, a zealous and dangerous preacher. The collection concludes with the narrator attempting to speak with his dementia-stricken mother and, in her, seeing the mother of Odysseus, “an empty flitting shade” breaking her son’s heart as her image eludes his attempts to embrace her. Working from historical sources, a broad empathy, and a mischievous imagination, Smith is able to find wry dark humor and a little succor in the presence of Civil War survivors, rogue musicians, and adventurers. Whether the subjects are major players in the story of America or squabbling Appalachian farmers, Smith keeps hoping their domain will be redeemed from violence. Even damaged Mary Lincoln, incarcerated in an asylum, has a magical blue bird to guide her toward escape and revenge, and dulcimers played in familial harmony make the mountains ring. "Memory has one horizon," wrote George Seferis: R.T. Smith’s superb new collection resonantly exemplifies this claim. Beginning with historical monologues and studies of characters as various as Mary Todd Lincoln, Audubon’s assistant, and Patsy Cline, and ending with recollections from the author’s own childhood, Smith refuses to draw a distinction between the historical past and the self as it negotiates the mysterious intricacies of memory. Like the tragic spiritualist Mary Todd Lincoln, Smith’s aim is to summon up the dead, both the famous and the obscure, and to give them voice, allowing them to speak in a language that is at once vernacular and formally elegant. These are haunted, empathic, and durable poems, composed by a writer working at the height of his considerable powers. Hang on to your hors d'oeuvre, because this crush is a party. Everyone's here: Mary Lincoln flashing her new lace gloves, Lizzie toting her ax, and Audubon with his bloody birds. There's Meriwether Lewis sporting his bullet holes, and even Jerry Falwell whose heart gave out "after so much fried chicken / and inspiration." The entertainment? Patsy Cline in perfect pitch. The drink? Sparkling language straight from the punch bowl. And what a punch R. T. Smith has given us. It's one thing to know history, it's another to recreate it, call it up, and invite you to the party. I loved this book. Among the many pleasures offered in SUMMONING SHADES, as in each of R. T. Smith's collections, are the many years of his generous attention to nature, to the richness of Southern language and life, to music, and much more. One of his greatest gifts to us you can hear if you "listen with your/ heart's full force" / "voices elegant with lore and love."